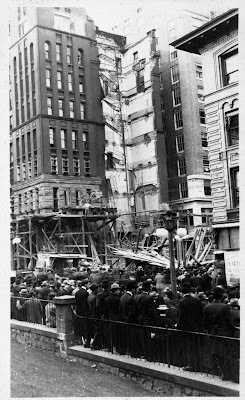 Through the shortest days of 1889 into the first weeks of the new decade, sounds of construction echoed from the blocks around Morrison, between 6th and 7th, as the Hotel Portland and the Marquam building raced toward completion. The Hotel Portland, re-animated after a six year hiatus by the mercurial George B. Markle, promised to be the city's largest and most luxurious hostelry, while the Marquam Grand Opera House would be its most opulent entertainment venue. Of the two, the Marquam was further along. As plaster set in the scaffold draped auditorium, its management encouraged speculation that it might be completed by Christmas. The Marquam building from 6th and Morrison, nearing completion. Judge Philip A. Marquam and his family lived on the opposite corner of the block at 7th and Alder, in a house known for years as "the little New England cottage." -Photo courtesy of Norm Gholston. "You can tell the people of Portland that Judge Marquam is going to give them a theater, second to none in the country in point of beauty, comfort and artistic finish. There will not be a bad seat in the house, and the indoor decorative work will be on a scale befitting the general richness of the structure. My efforts will be directed towards giving a series of attractions in keeping with the theater, and of a character to reflect credit upon any first class house in any city of America. I am confident that the result will justify me in doing this, feeling well assured that the public generally, and particularly the better class of people, of Portland will appreciate my labors." The New Year passed. Anticipation grew as Portlanders looked forward to productions of a quality and scale unprecedented. "It will be the first time that our people have the opportunity to listen to grand opera by a competent company, and they will no doubt take advantage of the occasion to come out in full force and in full dress." 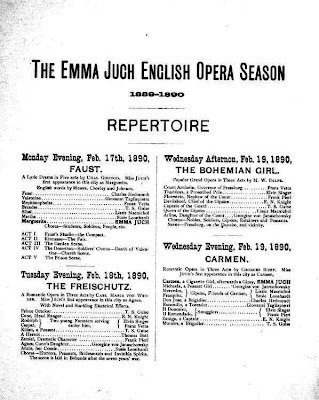 For the opening, the Emma Juch Grand English Opera Company, fresh from an appearance in Washington D.C. before President Harrison, were to perform a week long engagement of seven operas. 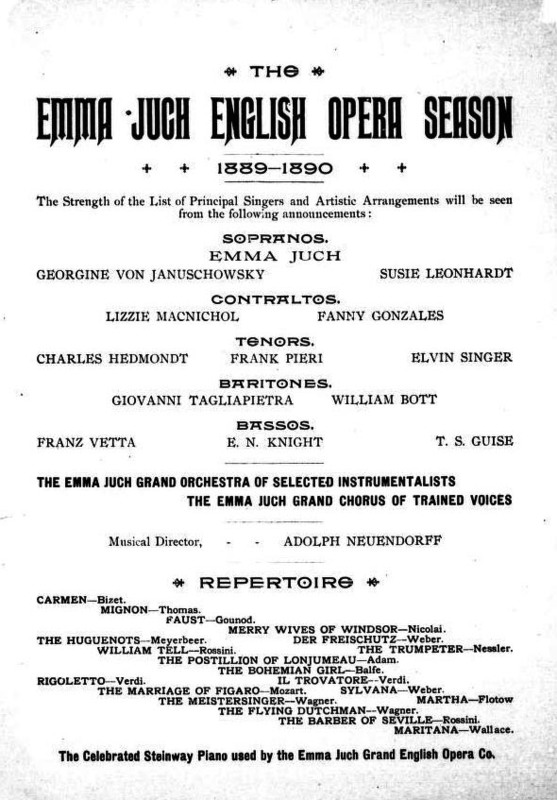 Soprano Emma Juch was born July 4 1865 in Vienna Austria. Her family came to America when she was two. 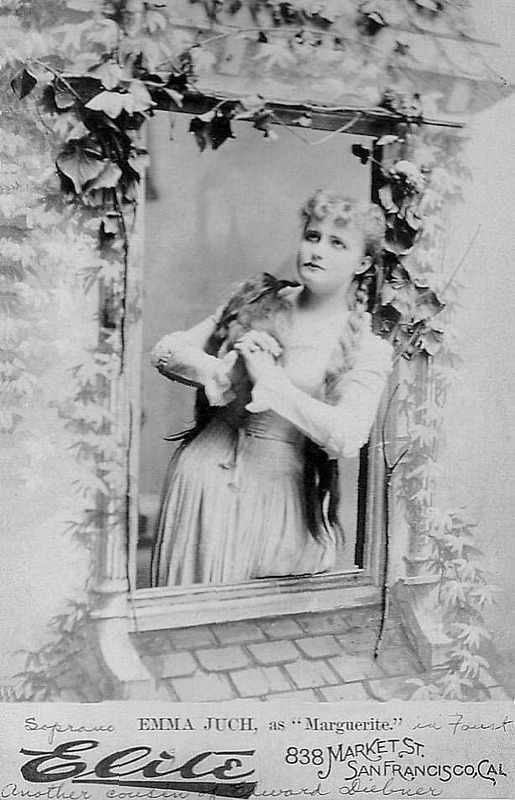 Her debut was in 1883 as Felina, in Mignon, for Her Majesty's Grand Italian Opera company in London. She joined the American Opera Company in 1886. When it disbanded, she formed her own touring company. As January drew to a close, anticipation turned to ennui as the wait drew on. "The dramatic world has partaken the same air of dullness and uneventfulness that has characterized the business life of the city in the past week. With the exception of the farce comedy "Rooms to Rent" at the Musee-Theatre and the Georgia Minstrels at the New Park, the last there has been nothing of even moderate interest to attract the amusement seekers." -The Oregonian, January 26 1890. 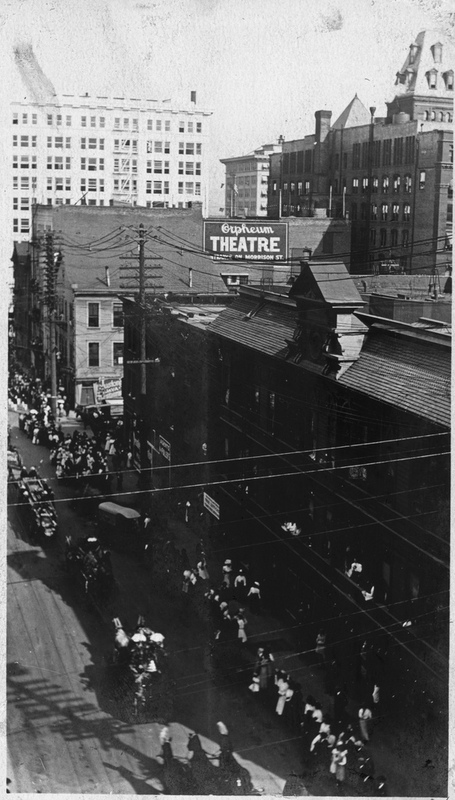 The New Park Theatre, where the Georgia Minstrels played, on the corner of Washington and Park, seen in a later incarnation as the Empress Theatre. "Say what one will, there is something interesting and amusing about a good minstrel performance". -The Oregonian, January 26 1890. At the dawn of the 1890s minstrel shows were in decline but still popular entertainment. Troupes of white performers, their faces blackened with burnt cork, had been portraying stereotypic depictions of African Americans in reviews since the 1840s. 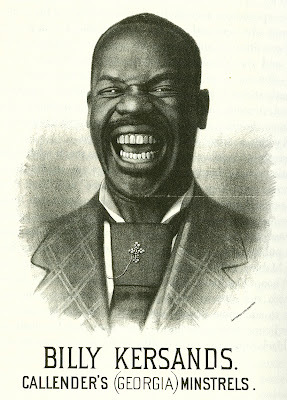 The shows featured comedy and songs, largely by white northerners such as Steven Foster, which presented an idealized version of southern slave life with only the most tenuous links to reality. 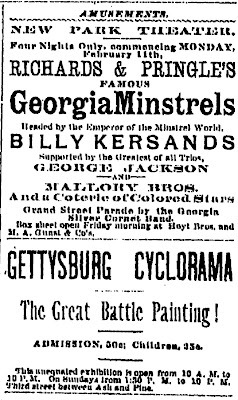 Richards and Pringle's Georgia Minstrels, opening at the New Park Theatre, were a relative rarity; a successful minstrel show comprised of African American performers. "As a rule, the colored man cannot illustrate the peculiarities of his race so well as the white man, and for this reason, minstrel companies composed of representatives of the dark skinned race have not been so successful as those composed of their white brethren. But Richards and Pringle's minstrels are of the exceptions." -The Oregonian, January 26 1890. Featuring Billy Kersands, singer, comedian and master of "The Essence," a complex forerunner to soft-shoe, the company was nationally popular with both black and white audiences. They had played in Portland before to good reviews. Bound by the conventions and expectations established by white minstrel shows, they performed wearing burnt cork, in blackface. "The African American Minstrel troupe that captured the larges and most loyal black southern following in the 1890s was Richards and Pringle's Georgia Minstrels". -From Out of Sight: The Rise of African American Popular Music 1889-1895 by Lynn Abbott and Doug Seroff. Billy Kersands got his start in traveling minstrel troupes in the 1860s. In 1875 he wrote Old Aunt Jemima, a song thought, unlike most minstrel material, to have been drawn from actual slave song origins. In 1889 it was heard by Chris Rutt, who appropriated the name for his newly created brand of pancake mix. Richards and Pringle's Georgia Minstrels arrived from San Francisco by steamship early on Friday January 24th and immediately went to work to prepare for their opening at the New Park that same night. In addition to Billy Kersands, the sixteen person troupe featured Billy Farrell and Will Eldredge, solo trombonist W.O. Terry, harmoniconist Will G. Huff and Gauze, a female impersonator. Miss Gauze's presence was not unique. Nick Tosches, in Where Dead Voices Gather, notes that while females in minstrel shows were relatively rare, drag acts were an element from nearly the beginning. He draws a direct line from the female impersonators in minstrel shows, moving on to vaudeville, from where Milton Berle bought the tradition to television in 1948, to Some Like it Hot in 1959, to Ru Paul in the 1990s. 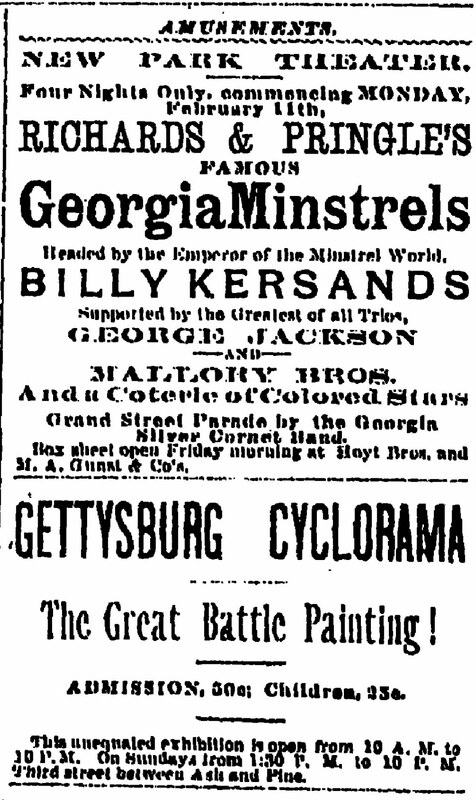 Advertisements for Richards and Pringle's Georgia Minstrels at the New Park, and the Portland Cyclorama in the Oregonian from the previous year. The Georgia Minstrels played three nights at the New Park, closing on Sunday, January 25th. Two days later, tickets for the opening of the Marquam Grand, set for February 3rd, went on sale at Kohler & Chase's Piano Emporium to a crowd that had waited outside the door since 6am. "There is no question about the house being ready, as the chairs and fixtures have arrived, the scaffolding is being taken down, the carpets are being laid, and the interior of the theater will be as presentable as though it had been opened for six months". -The Oregonian, January 29 1890. In actuality the chairs had not arrived. They were delayed in shipment and were not delivered until two days before the scheduled extravaganza. Opening night was pushed back a week. In San Francisco, Al Hayman scrambled to schedule an additional series of performances for the stranded Emma Juch Grand English Opera Company. On Monday February 10th the doors of the Marquam Grand Opera House opened at last, with a performance of Charles Gounod's Faust, to a capacity crowd enchanted by its opulence. Upon entering, the audience encountered a huge drop curtain portraying the countryside, town and castle of Monaco. They marveled at the theaters plush blue seats, the rooms exquisite finish, workmanship and luxurious private boxes. But the spectacle was not confined to the surroundings. "The opera house was packed from floor to dome by the culture, wealth and fashion of the city and a pleased surprise seemed to run through the entire audience as they gazed upon the interior beauties of this superb house." -The Oregonian, February 11 1890. Portland society came to see and be seen. Man about town, Cyclorama backer and Ainsworth associate Lester L. Hawkins was in attendance, as was Miss Albina Page, doubtless the only person present with a city named for her. Oregon state senate president and future Portland mayor Joseph Simon, Crater Lake booster William Gladstone Steel, North End entrepreneur and future Portland mayor George P. Frank could be seen among the various Failings, Everetts, Goldsmiths, Starrs, Bickels, Dekums, Burnsides, Ralieghs, Saviers, Holmans, Heitshus and Pittocks. The house of Ladd, minus its aging patriarch, was represented by sons Charles and Wesley. "It was as if everyone present realized the importance of the event from a social point of view, and was determined to do honor the occasion." -The Oregonian, February 11 1890. The somber evening attire of the men was offset by the elaborate stylings of the women, as the upper echelons of Portland society strove to outshine each other. Mrs. Richard B. Knapp appeared in a Paris gown of yellow satin with a corsage decorated with rich point lace and a diamond necklace. Mrs. C.E.S. Wood wore a dress of blue grenadine, with ornaments and diamonds, while Miss Nellie Burnside was noted in a gown of white crepe, lace embellished corsage and a opera cloak of gray cashmere trimmed in white fur. In the center of the dress circle could be seen Mrs. Henry J. Corbett wearing a black laced cloak of white velvet, embroidered with gold ornaments and diamonds of exceptional brilliance, next to Mrs. Charles E. Ladd in black lace, ornamented by pearls. Simeon and Amanda Reed sat in the front row of the parquette circle near the middle aisle. Judge Marquam sat in his own private box with his wife and four daughters. 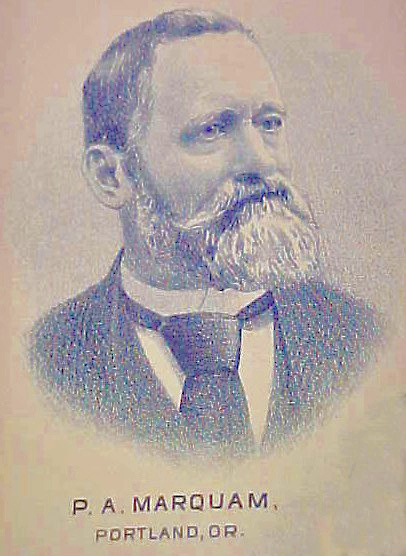 Builder of the Grand, Judge Philip Augustus Marquam. Like Billy Kersands and the Georgia Minstrels two weeks before, the 156 member Emma Juch Grand Opera Company had arrived by steamship from San Francisco. "Such a theatre is a monument to the artistic taste of the people in your city. I have been in the finest in this country and Europe and I find this equal to any. The acoustic properties of the house are all a singer could desire". "Few reach to a point of portrayal, either dramatically or vocally, which the roll demands. Among those few none, perhaps, so truly realizes the ideal of the master as does Miss Juch. She has the physical attributes which aid her greatly in her work -flaxen hair, the teutonic mold of features and a soft blue eye capable of a world of expression. She shows too, in her conception and execution of the role an intelligent idea of its demands which may singers have failed to exhibit". The only sour notes to be found were in reference to some of the audience and the dazzling scene's potential to overshadow the music itself. "It is to be regretted that quite a number of the audience came late, and thus disturbed the many who had good taste to be in their seats by or before 8 o'clock". "The people assembled on Monday night within the walls of the spacious auditorium of the new edifice, however, seemed to be there more to see each other, to examine the beauties of the house, to pass judgement, as it were, upon the general effect of the entire ensemble, than to listen with attentive ear and receptive faculties to the operatic performance that was set before them." "An inspiring scene. Fair women, well dressed men, and above all immortal music. The building itself is beyond doubt a triumph of architecture". 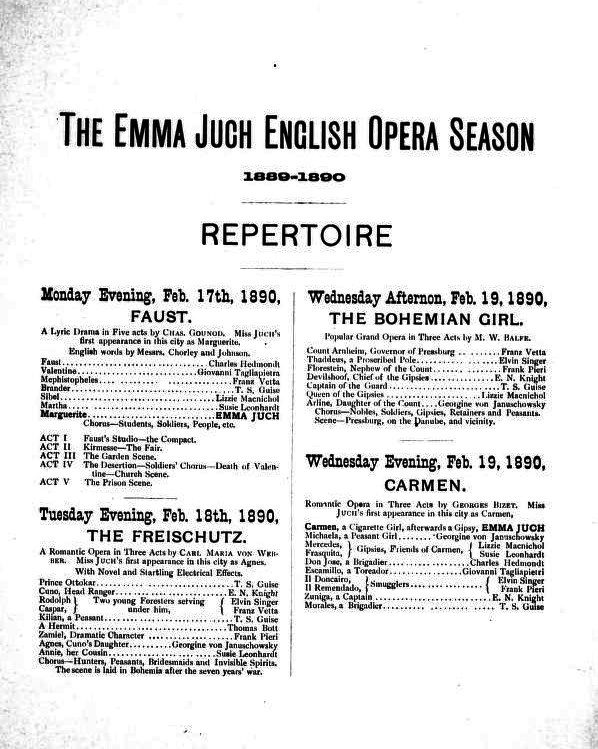 A program from the next stop on the tour for Emma Juch; the Victoria Theater in Victoria B.C. where she played a three night engagement starting on Monday February 17th. The order of productions duplicated their Portland sequence, minus the last three operas. The Emma Juch Grand English Opera Company continued to play the Marquam Grand to rave reviews for the next five nights and one matinee, then continued on to Victoria B.C. Portlanders could look forward to the next extravaganza, a comic opera, The Pearl of Pekin, featuring John C. Leach, said to portray the cleverest Chinese characterizations ever seen on stage. A rare view of the Marquam building from the north, taken at Alder and Park, including the auditorium itself, by then known as the Orepheum. It is likely this is a picture of the funeral for Portland Fire Chief David Campell in 1911. The colonial style house at Alder and 7th is the old Marquam residence "the little New England cottage." 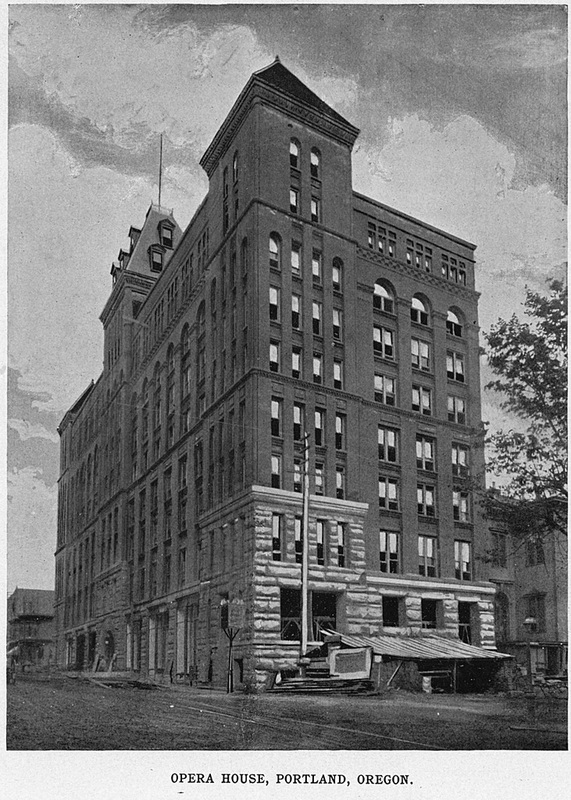 torn down in 1912.-Photo courtesy of Norm Gholston. 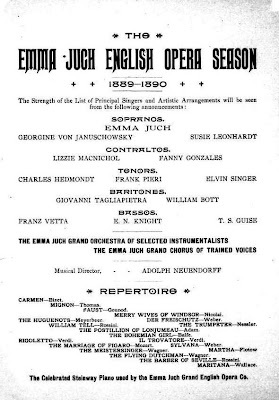 Emma Juch retired from Opera in 1894. She died in New York City in 1939. 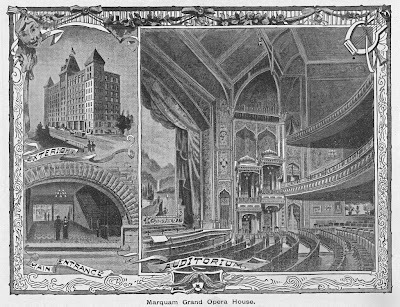 Billy Kersands, along with "the great Gauze" and Richards & Pringle's Georgia Minstrels next appeared in Portland at the Marquam Grand Opera House on April 30 1893, with a much expanded company that featured a band and orchestra. The troupes continued success would see them to travel in The Georgia, their own private rail car, an accoutrement which was, in the words of Lucius Beebe, usually "...the hallmark of millionaires, and mostly rich millionaires at that." Billy Kersands own view of the demeaning aspects of minstrelsy is perhaps captured in his quote: "Son, if they hate me, I'm still whipping them because I am making them laugh". He died in 1915. 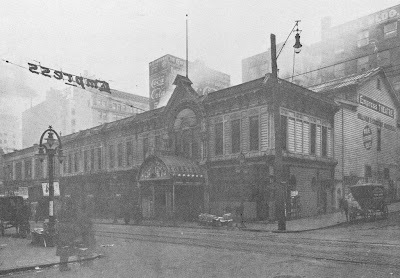 A late edition of Richards and Pringle's Georgia Minstrels played Portland for the last time at the Oriental Theater on Grand Avenue on October 27 1933. 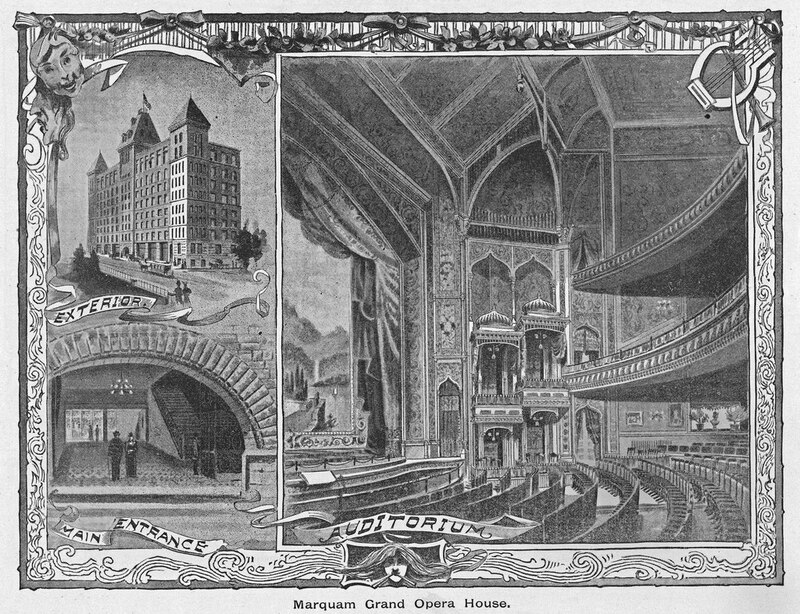 The Marquam Grand Opera House closed on April 1 1906 on the orders of Mayor Harry Lane's Executive Board for ignoring their fire safety recommendations pertaining to entertainment establishments. The final show featured George H. Primrose's Big Minstrels, lead by veteran white minstrel George Primrose who promised "...darkey life from long befo' the war to the present day". "Nothing but minstrelsy, no acrobats, or slap stick comedians -just minstrelsy pure and simple". The theater would reopen under numerous incarnations, often as a vaudeville house. It survived the collapse of the southeast side and demolition of the main portion of the Marquam building in 1912 and was torn down in 1922. The south east side of the Marquam building after its collapse in 1912. The building would be demolished shortly thereafter. -Photo courtesy of Norm Gholston. A link to a very early post on Cafe Unknown about the collapse of the Marquam Grand. Thanks to Norm Gholston for the use of his photographs, which to my shock included one of the Marquam under construction!